Chocolate can be found in our house at pretty much any time of the year, but chocolate at Christmas is an absolute must. I try and make at least one new festive chocolate recipe each year to give to friends or family and this year I’m delighted to have come up with this Christmas chocolate bark. 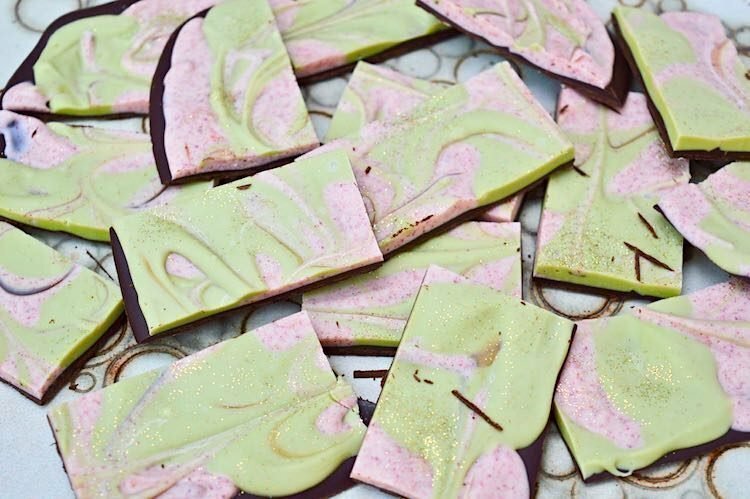 It’s a layer of dark chocolate covered with a swirled mix of matcha and cranberry white chocolate. It’s delicious. 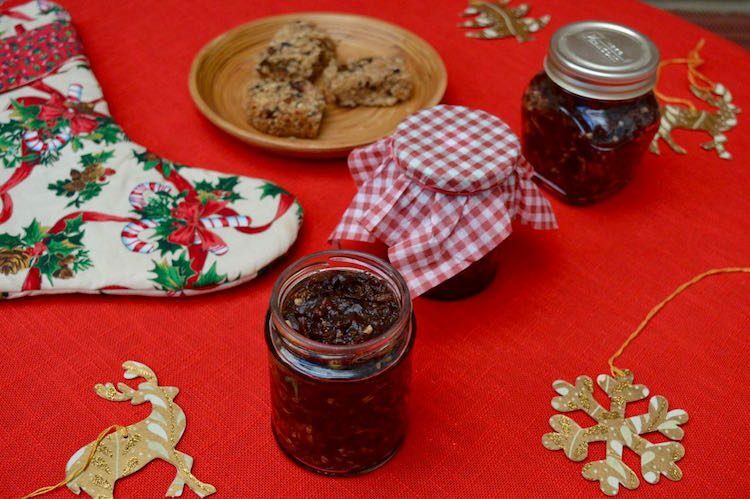 I’ve been making mincemeat for several years now. Once you’ve made your own it’s hard to go back to shop bought. But ding dong merrily on high, it’s fun to ring the changes by creating variations on a theme. This year I’ve opted for this warming and refreshing lemon & ginger mincemeat. If you’re running out of time to make biscuits but want to give homemade gifts this Noel, these Christmas Bliss Balls may be the answer. 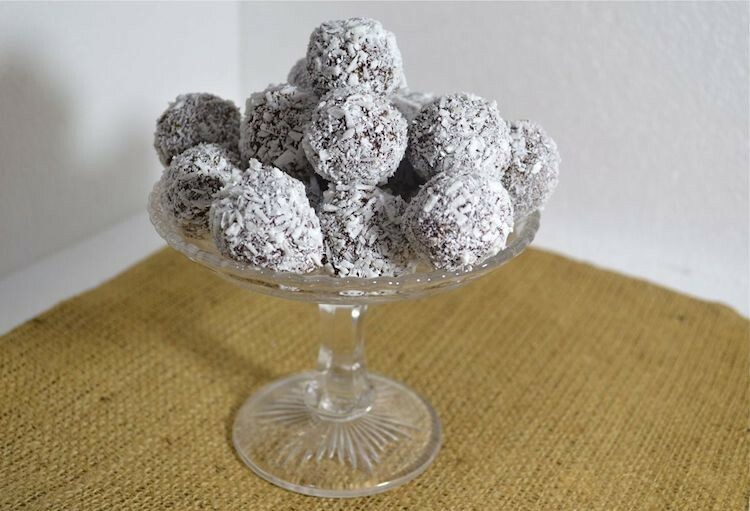 They’re not only delicious but are refined sugar, dairy and gluten free and easy to make. Rolling the balls in green pistachios, red cranberries and white coconut make them look wonderfully festive. Of all the biscuits I made in my epic Christmas bake last year, these pistachio biscuits made with almonds and flavoured with a little rose, cardamom and cinnamon were the ones that received the most rave reviews. So *drum roll* I’m finally going to give you the recipe. It’s the next in my Flavours of the Middle East series. Christmas is traditionally a time for baking biscuits and I usually make the most of it. I tend to make an old favourite or two, but also use the occasion to try out a some new recipes. One of them, this time, was to be Christmas Butter Biscuits. 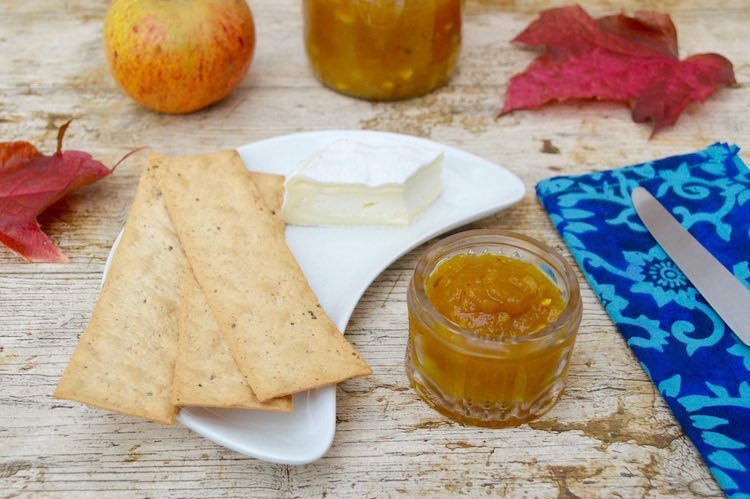 Fruit vinegars make a wonderful addition to many dishes. Vinegar captures the essence of the fruit beautifully reminding us of the season in which it was harvested. 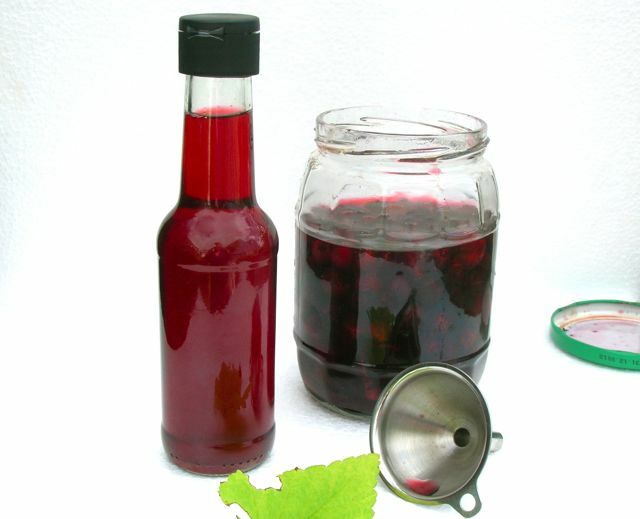 This blackcurrant vinegar gives a flavoursome tang to sauces, salads and desserts. It goes particularly well with beetroot. A little poured over simple vanilla ice-cream gives a real wow factor and mixed with water, it makes a refreshing drink. 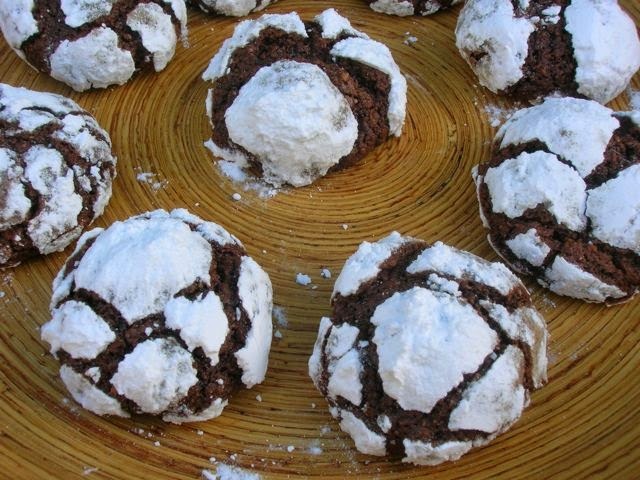 These chocolate hazelnut crackles were a Christmas gift bake that I made last year. They were so good, I meant to make them again this year. But flu got in the way and my Christmas baking was minimal. I bookmarked this recipe from Apple & Spice a very long time ago. The biscuits are made with ground roasted hazelnuts which immediately grabbed my attention. 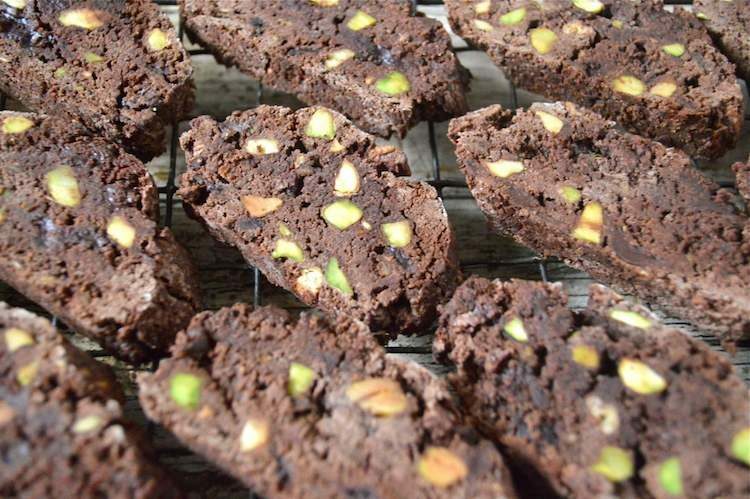 However, the first time I made them for Christmas 2012, I was fast running out of time and space in the kitchen, so swapped the hazelnuts for ground almonds. They were really good and proved to be highly popular with the recipients. But the fragrance and flavour of these ones made with freshly roasted hazelnuts beat the ground almonds hands down. The house smelt gorgeous whilst these were being made; first the aroma of roasting hazelnuts filled the air and then again when the biscuits were in the oven. 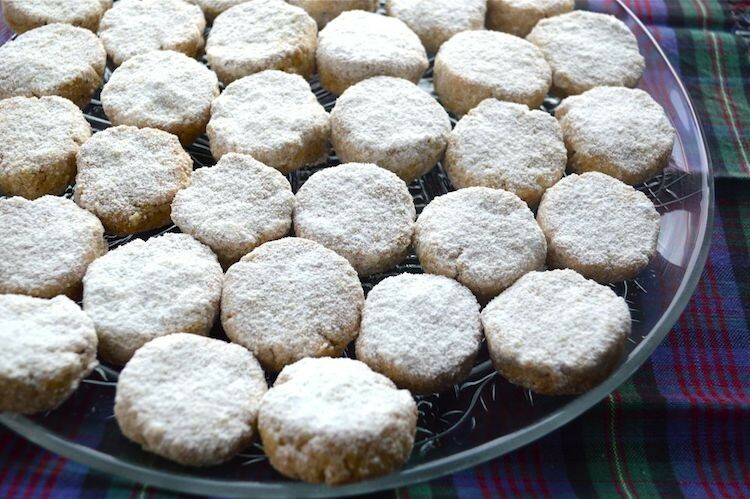 Rolled in icing sugar before baking, these cookies are visually striking and conjure up a snowy Christmas with sleigh bells ringing. The biscuits expand, revealing dark crevices beneath the white icing. Rich, indulgent, chewy and delicious these are some of the best biscuits I’ve ever made. I’d thought they were set to be a regular feature on my Christmas baking schedule, so I’m quite sorry I didn’t manage to make any this year. Roasted 80g hazelnuts at 180C for about ten minutes in order to give flavour and loosen their skins. Rubbed in a piece of kitchen towel to remove skins. Left to cool, then blitzed with 30g caster sugar to reduce to a finish crumb. Melted 175g dark 72% chocolate in a large bowl over hot water. Added 100g of unsalted butter – cubed. Stirred until melted. Beat in 275g dark muscovado sugar. Stirred in 1 tsp vanilla extract. Beat in 3 smallish eggs (or use 2 large eggs). Sifted in 330g flour (half wholemeal spelt, half white), 20g cocoa powder, 2 tsp baking powder, a large pinch of rock salt and 1 heaped tsp of mesquite powder. Added the ground hazelnuts and 2 tbsp milk. Left in my cold kitchen for a couple of hours until firm – no need for a fridge at this time of year. Sifted 100g icing sugar into a bowl. Wet hands with cold water and rolled mixture into walnut sized balls between my palms. Rolled balls in icing sugar until thickly coated and placed well apart on lined baking trays. Baked at 180C for about 12 minutes until cracked and well risen. I’m sending this off to Jac at Tinned Tomatoes as it is a Bookmarked Recipe.